Although I enjoy writing about my life and the fun things I do with my family, I miss writing about other people. After a thoughtful consideration and a little survey that I did with my readers, I have decided to revamp this section on my blog that has inspired many people since I first started it : Monthly Heroines! I don't know about you but I think our generation craves for the right people to look up to. 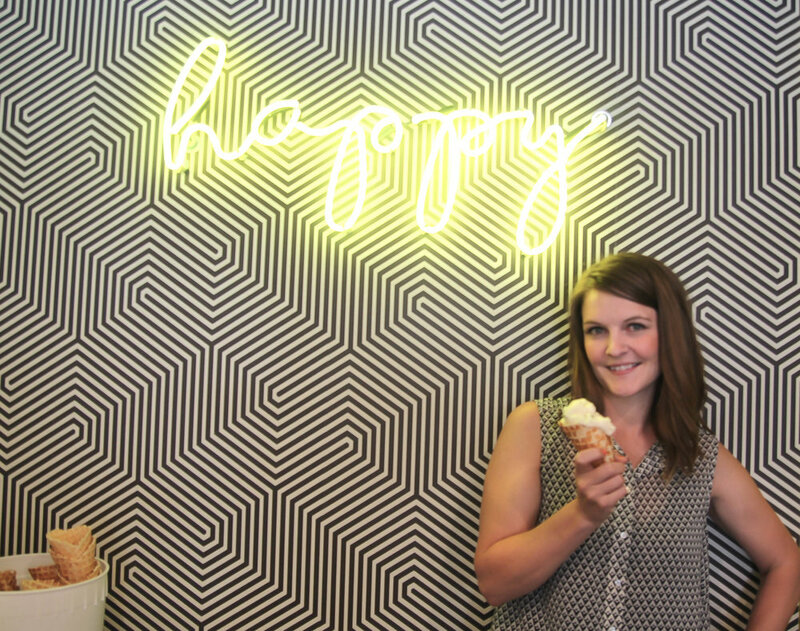 So when I thought of who to feature on my 'comeback' edition, I thought of this girlboss that I've admired for a while, Kari Crowe, the owner of Melt Ice Creams and Motor Sisters Ice Cream. Read it, be inspired, share it, and happy national ice cream month! You are not a chef, you didn't have any experience in running your own ice cream parlors before, so what got you into opening Melt? I had a passion for the food industry! I had been freelancing and photographing chefs, restaurants and food for a few years and when I started looking for a career change I really wanted an opportunity to add value to our community. Ice cream seemed the perfect fit for my community, it met my desire to stay creative and my excitement to build a business. The hot weather season that is so significantly long in Texas definitely creates opportunities for adding value with frozen treats. After opening Melt, have you ever thought, "This was not a good idea"? What kept you going? Opening a food business is no small feat, in my opinion it gets romanticized a little too often. It’s hard grueling hours, and there’s no magic formula to make it successful. I think as a business owner you always work through trying times and difficult seasons but how you respond, adapt and improve is what really matters. We make mistakes, our employees make mistakes but the value for us is taking those mistakes and turning them into opportunities to learn to be better, smarter and stronger for our customers and the future of our business. I think what keeps me going is learning to let go of things out of my control and improving the things that are in my control. Building a culture and a team that understands our vision and the future of the company keeps everyone moving forward! I read on your blog, that your husband quit his job last year. As a wife,were you panicked at all? What encouraged you guys to stick with Melt and go all in for this business together? It was a very calculated decision that we planned for and he kept great relationships with his industry peers. Mark coming on board brought a wave of leadership and dedication to push the organization to new strategic growth. We have such different strengths that we can play off of and I’m so grateful for that. What is the biggest lesson you've learned about opening/running your own business so far? the most impactful thing I’ve learned is to always keep learning, never settle. Any advice for my readers who might want to open their own business in the near future? Dive into researching and understanding your market, your customer, and your product. The more knowledge you have up front, the less surprise you’ll have when you launch! Anything exciting coming up for Melt and Motor Sisters that you'd like to share? Moving MELT was a big feat and our grand re-opening last weekend was amazing, our team and our customers rallied support. It was beautiful to be a part of! The new shop (1201 W Magnolia Ave #115, Fort Worth, TX, opens Tue-Thurs & Sun 12 pm – 10 pm and Fri-Sun 12 pm – 11 pm) allows us more production space, a larger patio and a larger parking lot as well as extended summer hours! We now have additional permanent flavors, seasonal cone pairings and seasonal sundaes! Coming up, we have Christmas in July, one our most beloved days of the year. We will celebrate this mid-year holiday with all things Christmas-related on July 23, you don’t want to miss it! I’m proud of Motor Sisters in Dallas because the brand embodies women empowerment and the ice cream offerings are fun and funky! Have you had the Amelia Earhart? It’s a combo of salty and sweet, crushed pretzels, crunchy peanuts and lots of nutella sauce! The Truck Yard is such a fun and eclectic place to be a part of! What are your all-time favorite ice cream flavors? This is a tough question! I have loved a lot of our non-dairy options like Coconut Curry and the Velvet Vegan! But currently the summer sundae is my favorite!! !